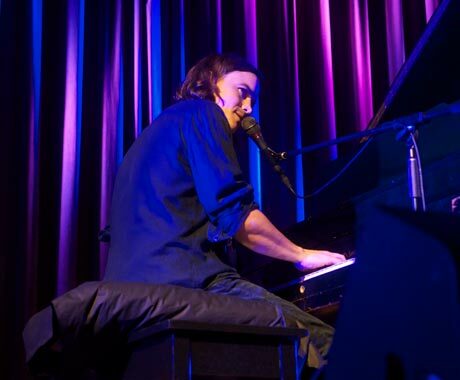 Spencer Krug, formerly of Wolf Parade, Sunset Rubdown, and Swan Lake, shocked fans by announcing a short string of solo piano shows back in May, debuting new material written during his first winter after leaving Montreal for Helsinki, Finland. Since the series, Krug has recorded the set, due for release on October 29 as Julia With Blue Jeans On, his fourth release as Moonface. Fittingly, Krug played his first performance since recording in the last city he lived in before the move. Whereas the solo piano concerts in May felt like a private affair between friends, the performance at the Ukranian Federation came off as a formal recital, with Krug on stage and the audience sitting in auditorium seats. After disarming the crowd with some endearingly offbeat banter about his torso size, Krug launched into songs from the album. Opening with self-acceptance anthem "Love the House You're In" and the angst-ridden "Black is Back in Style," Krug crafted soundscapes with only the piano and his voice to much success. Krug's command of the piano is quite a sight; he weaves intricate lines with each hand that cascade and coalesce like waves breaking on the shore. His warbling vocal timbre, distinct as ever, waxed tales of turmoil, introspection, and even love. As the hour-long set went on, Krug slyly joked about the sleepy nature of the songs, even going as far as saying that if any audience member were to fall asleep, he wouldn't blame them, but that would've been a difficult feat to achieve with the amount of raw passion and emotion that emanated from the speakers. The set's crowning moment took place during the album's title track, played near the end of the night, once Krug spoke the name "Julia" for the first time, the warmth in his heart filling the space. Krug's performance definitely deserved the two standing ovations he received, once after the set proper and the second after the encore. The encore track, a ten-minute non-album cut, was a powerful tune that ebbed and flowed fluidly. "That's as spiritual as I need to be," sang Krug several times throughout the track, and it was as spirited as he needed to be too, commanding a wide range of emotions with limited resources. While Krug no longer calls Montreal home, the crowd at the Ukrainian Federation made it clear that he was missed, holding onto every moment of the set in hopes that he would stay.